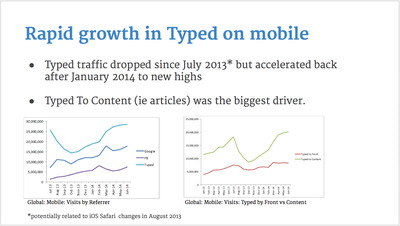 Normally, web publishers can “see” where their readers come from. If you search for a story in Google, publishers can see that you landed on their site via a Google link, for instance. 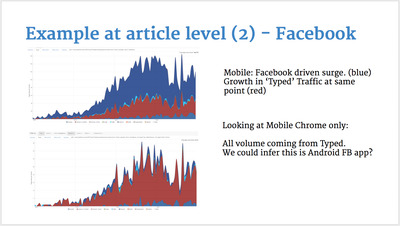 Generally, the biggest sources of incoming reader traffic are Facebook and Google. But recently, a massive chunk of The Guardian’s readers have become invisible. On some stories, dark traffic is a more important source of readers than either Google or Facebook. 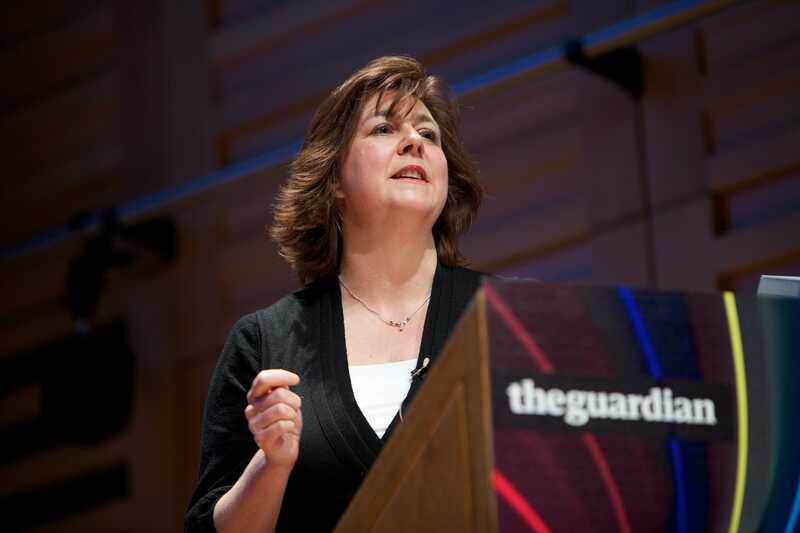 The problem is almost certainly affecting many more publishers than just the Guardian. (At Business Insider, we have also seen traffic that displays similar symptoms to the Guardian’s dark traffic.) It is just that Cordrey is talking about it more openly than her colleagues. The GuardianGuardian chief digital officer Tanya Cordrey. The Atlantic first identified “dark social” traffic back in 2012 to describe traffic coming messaging apps that had been stripped of referrer data because messaging and email use the secure “HTTPS” system rather than the open “HTTP” system used by web pages. Dark traffic is vexing because web publishers like to be able to offer their advertisers solid data on the quality of their readers. And editors like to know which types of readers are enthusiastic about their stories. Dark traffic threatens to undo all that. The issue is a big deal for The Guardian because of its massive global footprint in the digital news business. Ten years ago, The Guardian was an also-ran as Britain’s 11th most-read newspaper. More people read regional papers like Scotland’s Daily Record and London’s Evening Standard than the Guardian, which had only 383,000 readers. The country’s news agenda was driven largely by The Times and The Sun, which circulated 3.4 million papers. 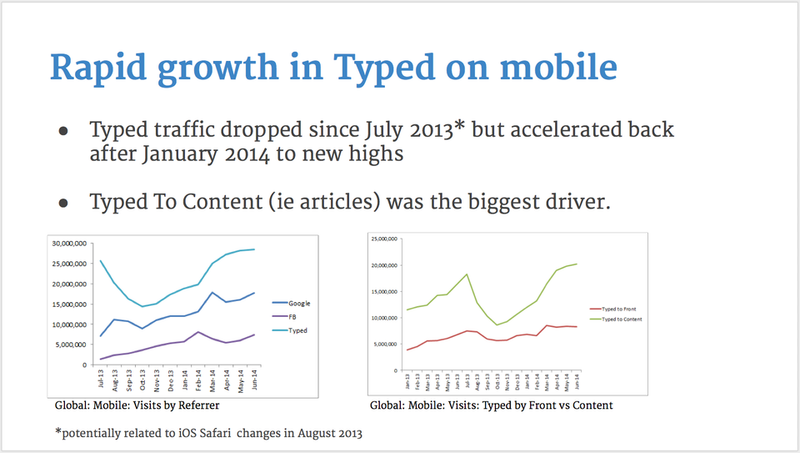 The Guardian’s massive website and mobile app now dominate news online, especially for left-leaning folks. It has 167 million visits a month from readers, according to Similar Web. Sources tell Business Insider it gets more than 100 million unique readers per month. The only UK media brands that stand in the Guardian’s way right now are the BBC (which has the unfair advantage of receiving tax-funded special treatment from the government) and the Mail Online (which airs content The Guardian steers clear of). Here are some of The Guardian’s charts illustrating the scale of invisible web readers. Cordrey has used the term “typed” to describe dark traffic visits because previously the company thought those readers were coming directly to the site after literally typing the URL “theguardian.com” into their web browsers. But the number of “typed” visits has become so massive that they are obviously coming from unknown links elsewhere on the web. People don’t type in the URLs of individual stories to get to them. Business Insider asked both Google and Facebook whether they were aware that their apps were generating mobile traffic that lacked referrer information. Neither company responded. 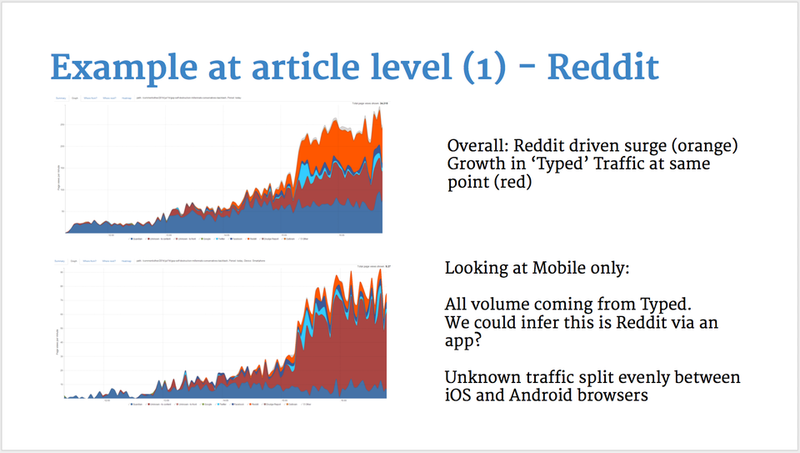 The fact that dark traffic is coming from an increase in readers using Android apps to read the news does not really solve the mystery. Android has an 80% share of the mobile user market globally, and there are about 1 million apps available for its phones. About 69% of sharing that goes on inside apps is of web content. There is no way of knowing which of those apps is actually popular with readers. So The Guardian is flying blind when it comes to millions of Android users. There are a couple of alternative theories about the origin of dark social traffic: One, as mentioned previously, is the increasing use of web sites that use the “HTTPS” secure standard. This standard renders traffic anonymous in order to increase users’ privacy. Since Edward Snowden’s revelations about NSA surveillance, more sites have adopted HTTPS standards. Hacker News and Wikipedia, for instance, use HTTPS and all traffic coming from them now shows up as if it were “direct” traffic. 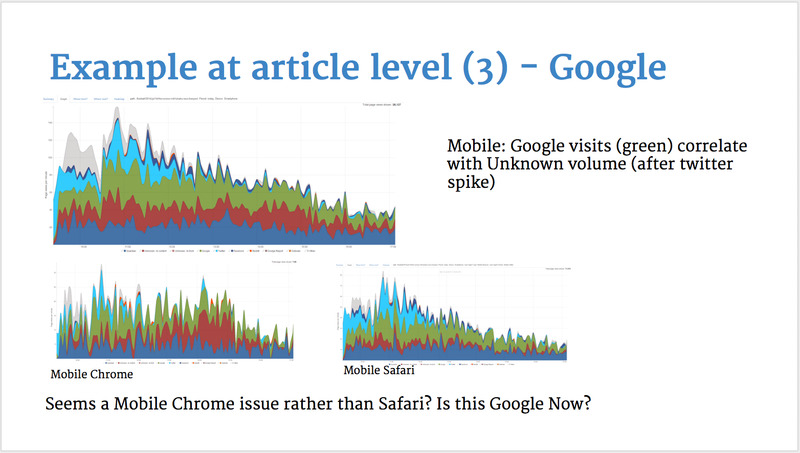 The frustration here is that search, apps and HTTPS traffic all represent different types of readers arriving at The Guardian for different reasons — and not knowing that data hurts the Guardian’s ability to serve those readers relevant content. There is of course one “winner” in all of this: If Google is retaining information on Android’s dark traffic, then it would benefit Google if the search giant wanted to offer that information as a targeting mechanism to advertisers, especially if publishers were blind to the data. But as Google did not return our call, we cannot say that for sure.